In my mind, The Riverview Hotel is known purely for their harbour views, seen from the roof top bar. Each time I have visited the Glenmore, the bar has been packed out with people, and I never really realised that there was an option to dine indoors as well. This devastation, however, was short lived as the quality of the food trumped my excitement for the roof top views. I ordered the Chicken Katsu Burger; crispy succulent chicken, topped with melted american cheese and katsu sauce, with mayonnaise and coleslaw. Who would have thought that a traditional Australian pub nestled amongst the quiet streets of the rocks would create such a clever dish! The other dish we ordered was the slow cooked beef ribs. These babies were perfectly caramelised, and extremely succulent. I think this dish should have been paired with some mash, or a crisp salad to cut through the heaviness of the ribs, however all in all they really good! Furthermore, we were placed in a Victorian style dining room, which for most of the afternoon we had all to ourselves. It was very peaceful and relaxing. The downside to this was that the waiters only came to our dining room every so often, service was very slow. I look forward to returning on a sunny Sunday afternoon to soak up the sun and the harbour views, however all in all I was pleasantly surprised at how lovely our dining experience was despite the weather. Big Daddy’s Burger Bar is an American chain, that has just branched out and hit the streets of Sydney. They are most famous for their deadly burgers, and their loaded curly fries. Of course, as burger LOVERS, recollectionsoffood had to check this place out! To start, we ordered milkshakes. Their milkshake menu was elaborate, and as an American burger joint, I had high hopes for their milkshakes. We ordered the ‘New York Chunky Choc Shake’ and the ‘Maltesers Shake.’ The New York Shake was delicious, thick and sweet, and had chunky pieces of chocolate throughout. The Maltesers shake was pretty similar, just a classic choc shake. For our main, we ordered the ‘Who’s Your Daddy’ burger. Inside was a beef patty with pulled pork, coleslaw, American and Swiss cheese, Canadian bacon, American mustard and mayo. This burger was crazy good! The bun was soft and lightly toasted, the combination of pulled pork and a beef patty was heavenly! The only criticism I have for this burger is the fact that the bacon wasn’t crispy, however this didn’t stop me from eating it. We also ordered the Chicken and Bacon Waffles. I was reluctant to order what seemed like a breakfast and dinner dish combined, but man oh man this was so good! The waffle was fluffy, with bacon pieces throughout. The chicken on top was a little dry at times, but the portions were generous. The thing about chicken and waffles is that I get bored of the flavours quickly. It wasn’t my favourite dish on the menu, however it was still very tasty. For our sides, or ‘Teasers’ as the menu so cleverly put it, we ordered the cheesy fries, the cheese sticks and the chicken wings with blue cheese sauce. The cheesy fries were a stand out! I could have eaten just this dish as my main and have been satisfied. The curly fries were crispy, the bacon was plentiful, and the cheese sauce was disgustingly good. The cheese sticks I could have done without. I would describe it as a breaded cheese stringer. They didn’t have much flavour and the cheese had become hard by the time we ate it. The chicken wings were delicious, just like the chicken on my waffles, at some points dry, however mainly cooked well. The blue cheese sauce however was pretty gross. It was electric blue in colour which weirded me out, and it tasted VERY artificial. All in all, we would return to Big Daddy’s just for their burgers, curly fries and shakes, as they were a stand out! I think this place is going to be the next biggest foodie destination. *recollectionsoffood were invited to dine at Big Daddy’s Burger Bar by CP Online Marketing, however all opinions are our own. Two weeks ago, I was visiting Perth – My favourite city! I love Perth for its relaxed people, hot sun and great food! I was browsing around Brighton Road Food Market in Scarborough when I saw XO Tea for the first time. The gorgeous prints on the boxes grabbed my eye, and I was so intrigued to see what this beautiful tea was all about, as I had never seen it on the market before. XO Tea certainly has gorgeous packaging, and its marketing game is thus very strong, however this tea is not just average tea in striking boxes. Each blend of tea has been re-mixed up to twelve times to make sure the flavour is right. All of the teas contain natural Australian made extract, except the Guanabana tea, which sets XO Tea apart as most companies use synthetic flavour. So much care and love has gone into developing each of these teas, giving each blend its own identity and individuality. XO Tea doesn’t bring the name of the company glory, however gives glory to each of their blends of tea, and the amazing story behind them. I was lucky enough to be sent three of these amazing blends; Bossa Nova, Autumn Strudel and California Current. They all have an amazing story behind them, which helps me to appreciate each tea. Bossa Nova – The sencha green tea base is from China. Something radical and fresh to help people live in the present. The world is becoming fast paced and we are always focusing on the future rather than the present. This infusion is spicy and fruity with a green tea kick making its flavour and aroma stand out. We hope that when people drink it, for that few minutes, they will relax and just live in the moment and stop worrying about the future. Autumn Strudel – The black tea base is from Sri Lanka. Its Inspiration came from spending a weekend during autumn in NYC. The fantastic colours of autumn coupled with the cool weather gave way to a weekend of hot tea, apple pie and the occasional glass of red wine. California Current – Sourced from USA. The California Current is a cold water tidal current that runs down the west coast of the USA from Alaska. Peppermint tea is cooling and refreshing hot or iced and reminds us of plunging into the icy cold ocean which is the concept behind this tea. After trying each of these teas, I definitely see that each mix is full of strong, but delicate flavours. My personal favourite is the California Current. I have always been a huge fan of the T2 peppermint tea, but there is something different about California Current. It has a crisp freshness to it, which the T2 version doesn’t have. For people that enjoy sweet tea, the Autumn Strudel is delicious, much like a dessert tea! However, for me it was a little too sweet. The Bossa Nova is definitely Boss! Opening the pack I was overwhelmed at how gorgeous the scent flowing out of the foil was. The Goji berries add the most incredible sweet element, however coupled with the lemon grass and ginger, it was the perfect combination to balance the sweetness out. I LOVE this tea! XO TEA can be found in sixteen retail locations across Perth, however can be purchased online, Australia-wide. It was a night of elegance and sophistication. 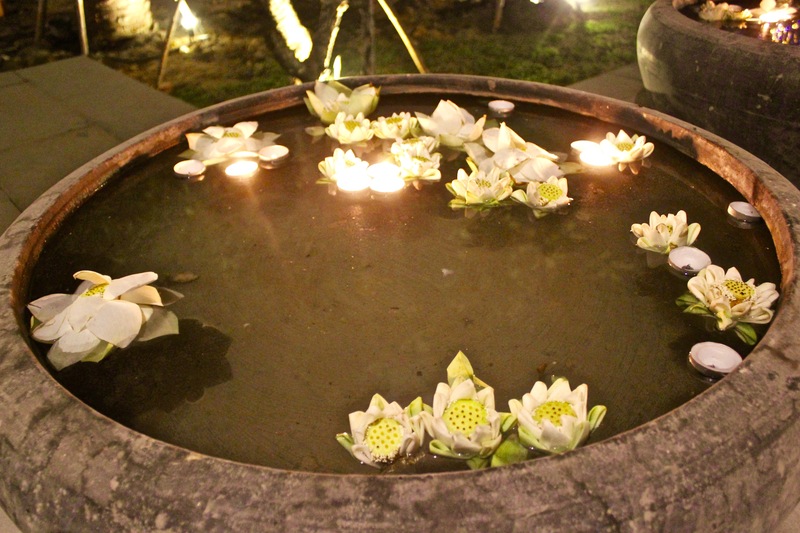 Malis put on a fine show of the best food Cambodia has to offer. 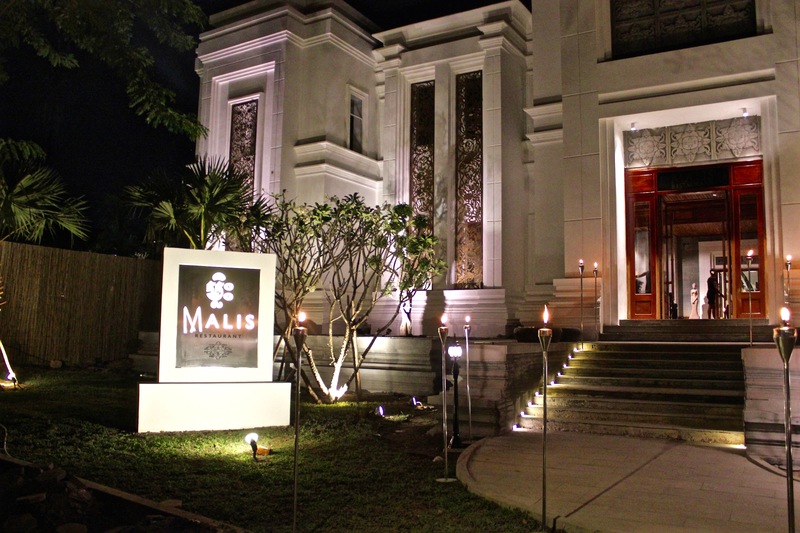 Located by the riverside of Siem Reap rests a newly built, palace-like building, which is home to the top Cambodian restaurant in the country – Malis. 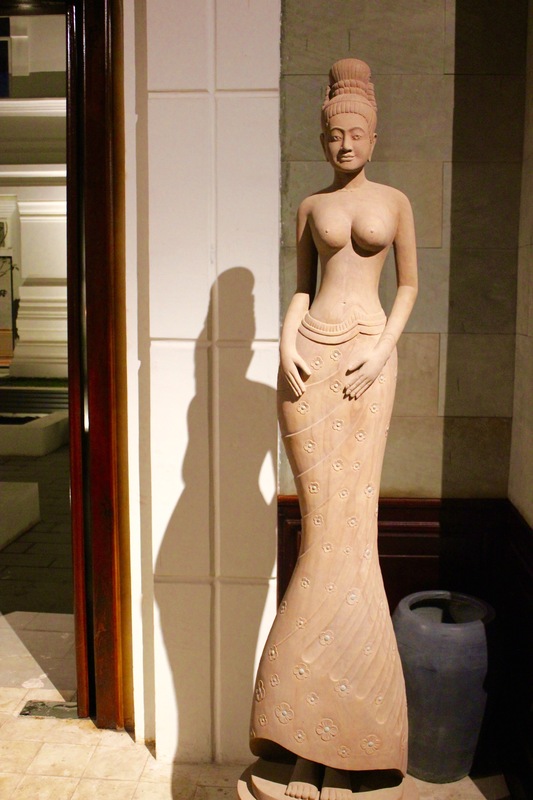 Malis plans to ‘safeguard the the nations food heritage for years to come.’ The elaborate menu at Malis truly did showcase some incredible Cambodian food that I am so excited to share with my readers! 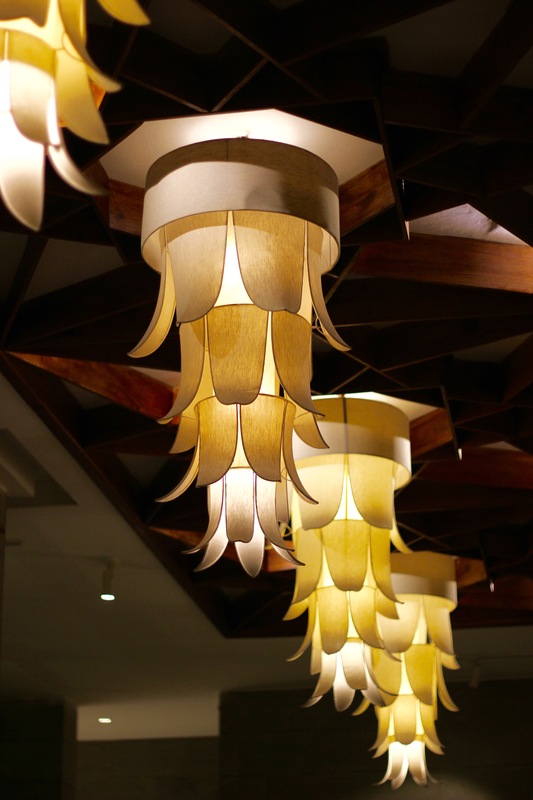 Walking in to Malis, I was in awe of the scale of the restaurant, the high roof, the massive sandstone walls, the huge lotus-style chandeliers – incredible! Stepping out of our tuk tuk, we were greeted by our lovely hostess for the evening, Leakena, who showed us to our table and walked us through the menu for the night. For entree, we ordered the Takeo Sausages ($9) The Cambodian Skewers ($11) and the Royal Mak Mee ($9). 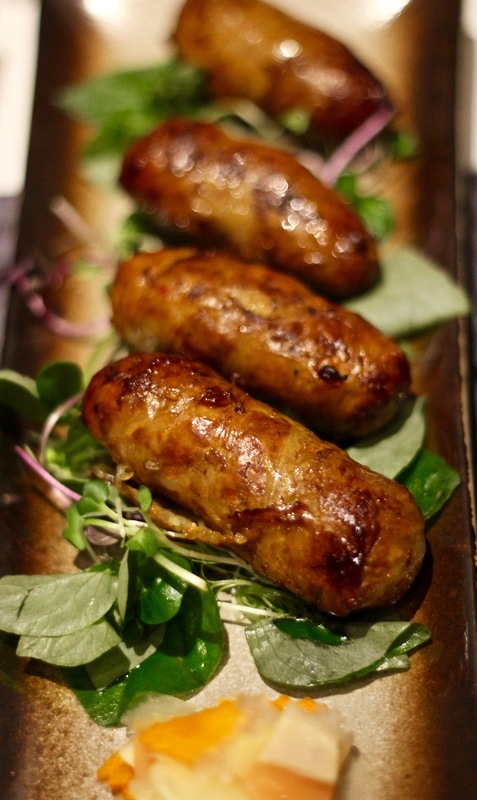 The Takeo Sausages are made on site using pork mince and coconut shavings. I am not a huge sausage fan, as they usually are very oily and lack flavour. However I would eat these any day! They were very meaty, and lean, with an incredible flavour. I would go as far as to say that these were the best sausages I have ever eaten. 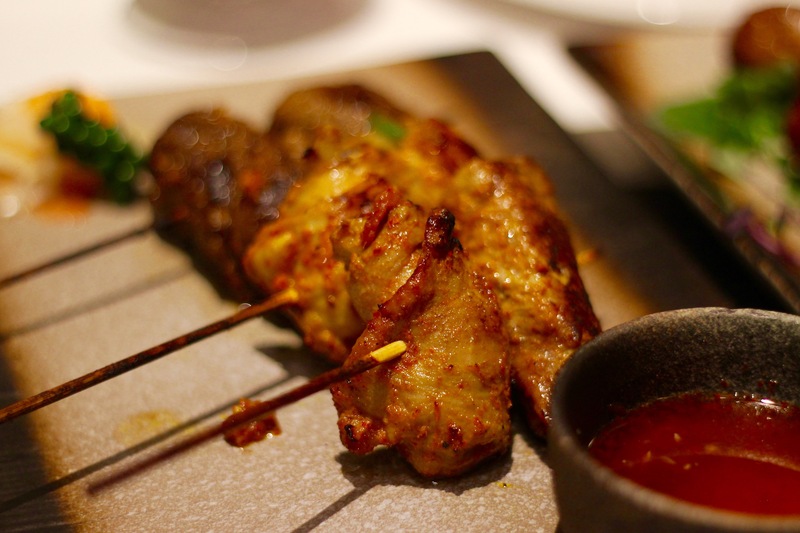 The Cambodian Skewers of tender beef, chicken and pork, marinated in a blend of Kroeung, young peppercorns, chilli and brown sauce. These skewers were very delicious, however I found them to be a little undercooked, and unfortunately I couldn’t finish eating them. 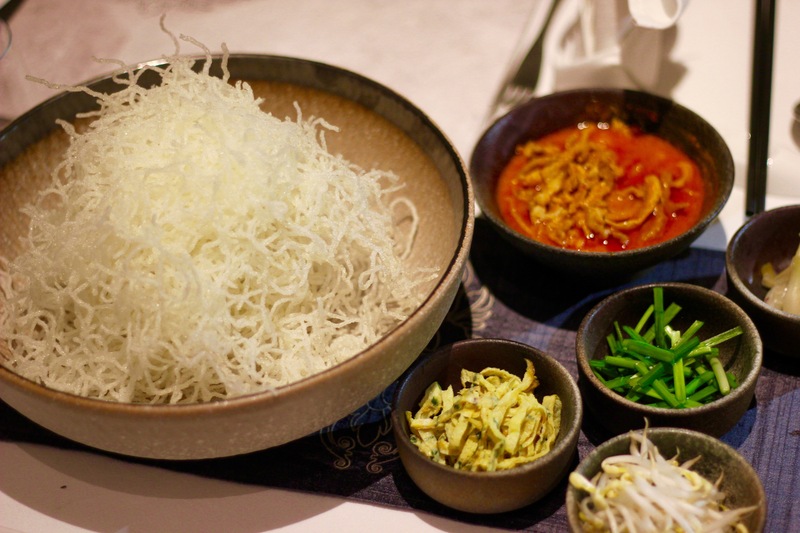 The Royal Mak Mee is a salad that I am still day-dreaming about! It was magical!! Crisp noodles with pork and lemon grass, this salad was so tasty. Apparently, this is the royal Palace’s recipe, and I can see why – it was a salad definitely fit for a king. For our main, we ordered the Baked Goby Fish with Young Mango Dip, he Kampot Rock Crab Red Curry, and the Kampot Crab Fried Rice. The Gobi fish was the stand out dish of the night! It was baked in salt, and was cut apart at the table by the waiter and served. 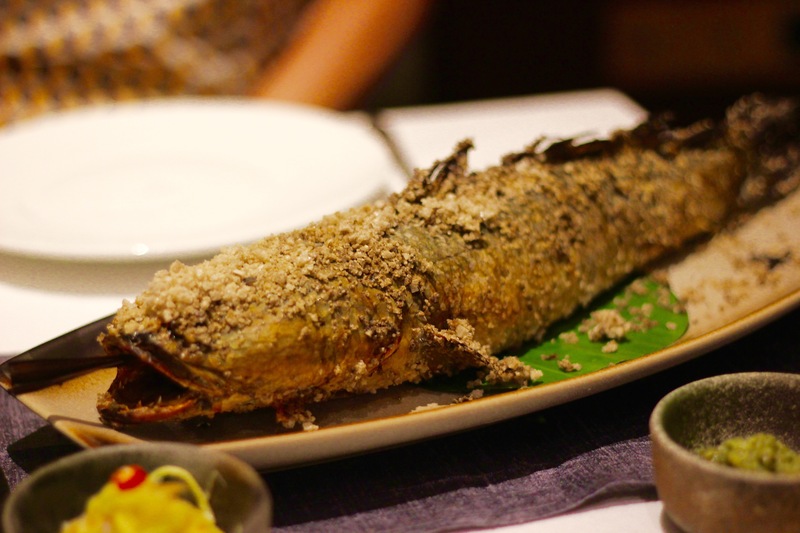 Goby fish is from the Tonle Sap, and has the texture of crab! I couldn’t believe this. It was the most beautiful, delicate texture, with so much meat and so little bones. 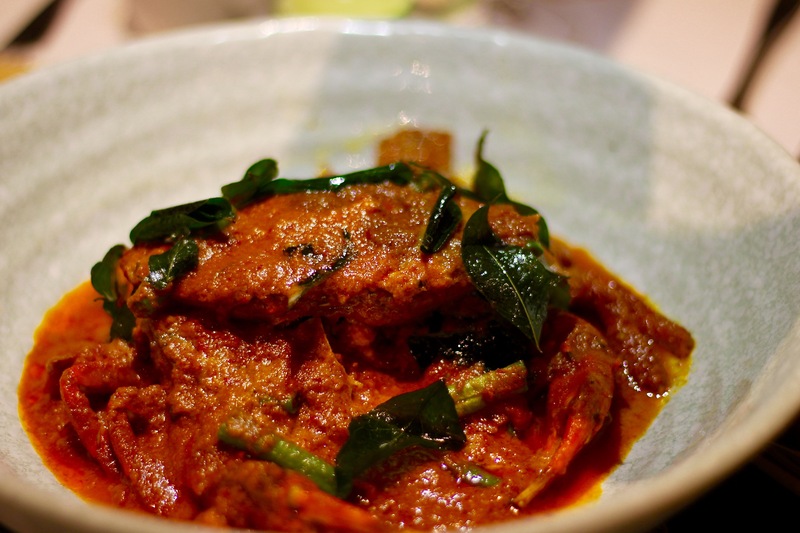 The Crab Curry was full of big, vibrant flavours, yet had the lightness of Khmer Curry, because of the addition of coconut milk. The crab was cooked to perfection, it was very succulent! The only downside was that I felt embarrassed to dive right into the crab with my hands and get all of that delicious meat out, as Malis was very fine dining! 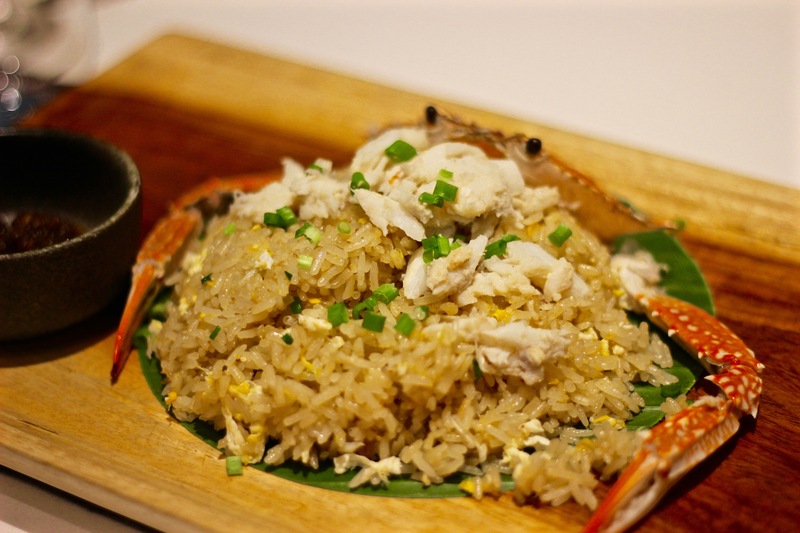 We also ordered the Crab fried rice which was just a standard fried rice, nothing too special about it other than the fact that there was a huge juicy crab sitting on top of the rice! For dessert we ordered the Durian Delight, however they were out of Durian ice cream, so it was coconut ice-cream. 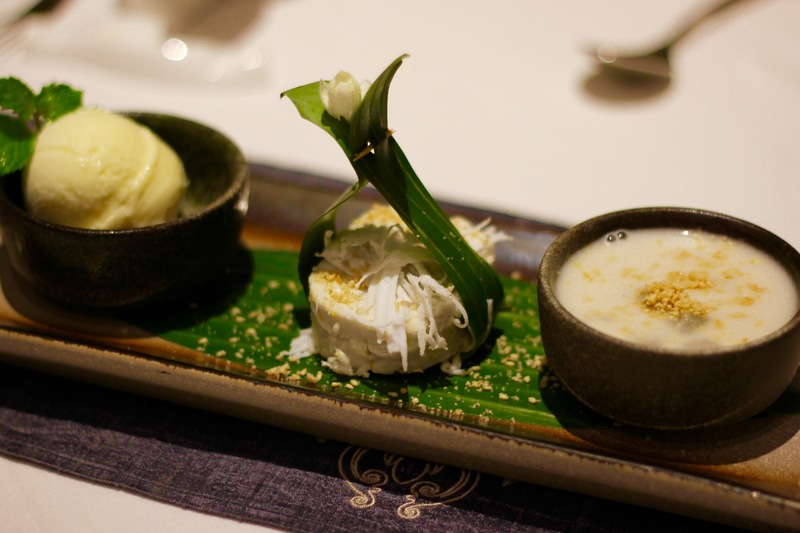 It came with three dessert elements; Taro style dumplings cooked in coconut milk and ginger sauce with Num Ko corn and coconut ice cream. The Coconut ice cream wasn’t as creamy as I would have liked, it was a bit more on the icy side, yet was still very refreshing. The Taro dumplings in coconut sauce were dreamy! 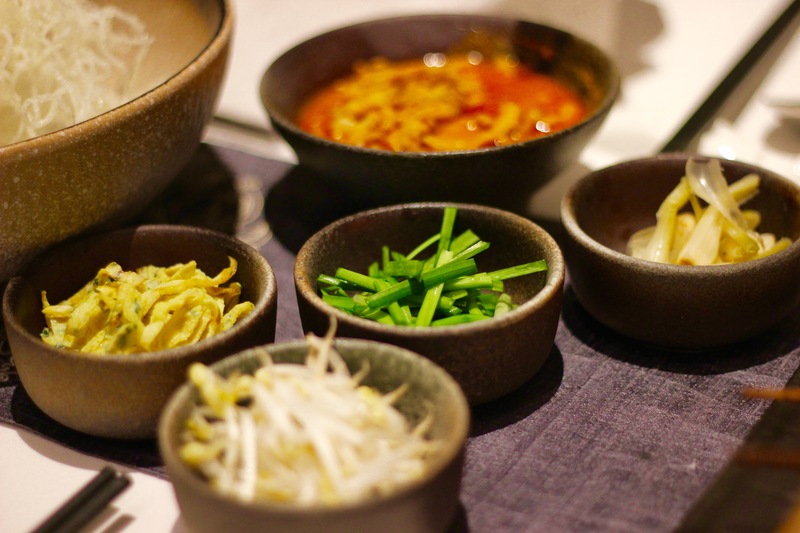 The dumplings were extremely soft – the texture was similar to Japanese Mochi. The Num Ko corn was okay, it had a bit of an odd texture but I still enjoyed all of the elements of the dish. 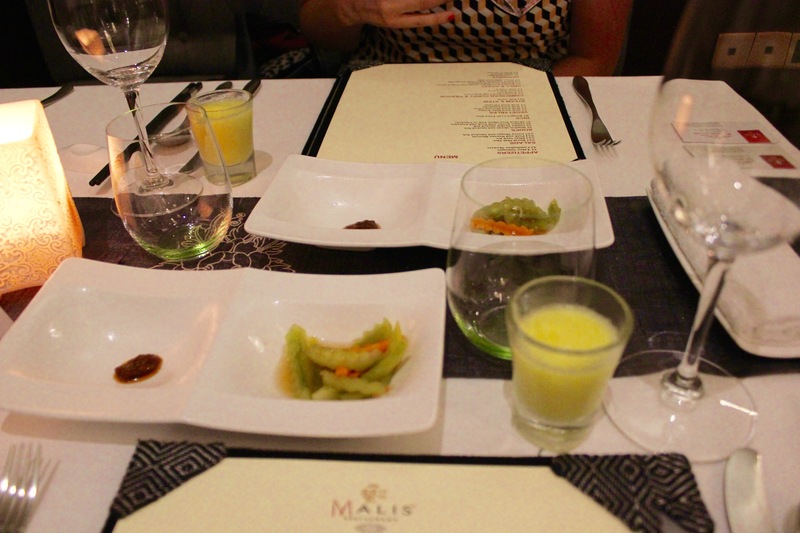 Ultimately, I had an incredible time at Malis and was so privileged to try the food! It was my favourite food experience of my entire 1.5 months in Cambodia, and I would recommend this restaurant to anyone visiting Siem Reap or Phnom Penh. *recollectionsoffood were invited to dine at Malis by the Thalias Group, however all opinions are our own. Cambodia, a nation of rich culture, a devastating past and extreme resilience! My visit to Topaz restaurant, Cambodia’s number one rated restaurant, was testament to how far this nation has come in terms of evolving from their broken past and pushing towards a future filled with prosperity and class. Topaz is one of a chain of restaurants in the Thalias Group. Topaz has been named one of the top fine dining French restaurants in South East Asia, and produces quality French dishes utilising only the best Cambodian and French ingredients. 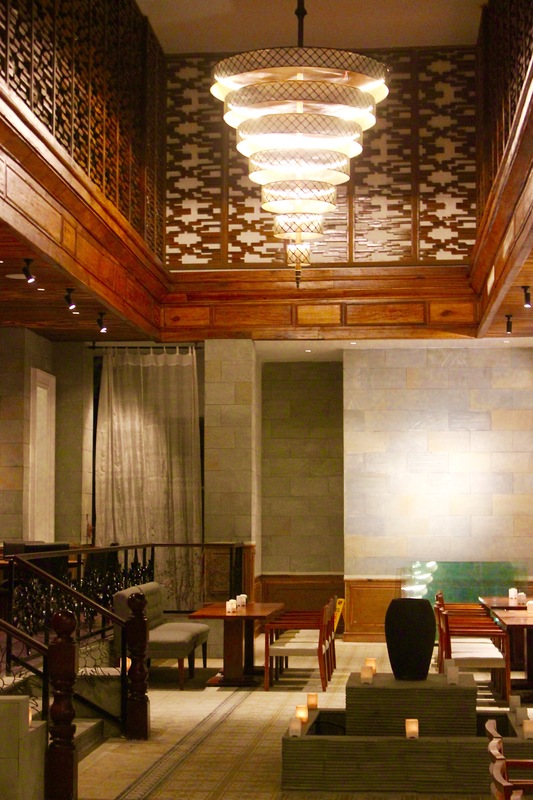 The Thalias Group also own Malis (A fine dining Cambodian restaurant in Phnom Penh and Siem Reap) and Khema (A restaurant and gourmet delicatessen). A visit to any one of these exquisite restaurants provides a stark contrast to the confronting slums that I have been spending my last few weeks teaching in; although an unforgettable and amazing experience that I have been lucky enough to enjoy and share with you in my previous blogs! On arrival at Topaz, I was amazed at how beautiful this restaurant was. 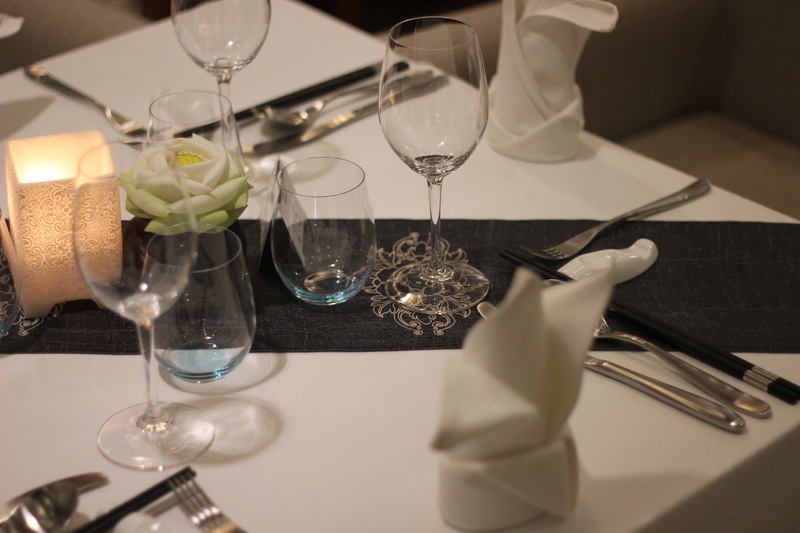 Located on Preah Norodom Boulevard, the ‘Champs Elysees of Phnom Penh’, this restaurant boasted class and elegance from the moment I set my eyes on it. Greeted by a parking valet and welcoming waiters ushering us into the restaurant, I knew I was in for a night of ultimate dining! All the waiters and waitresses at Topaz are trained in-house. This means that they have had no professional culinary service training; however, have learnt on the job. I found this quite extraordinary considering the staff were so professional, akin to that of any hatted Sydney restaurant. The restaurant itself was elaborate to say the least; high wooden ceilings, detailed golden paintings, beautifully ornamented tables – adorned with all the bells and whistles! To start, we had the Foie Gras Pot Pie. The pie dish was covered in crisp puff pastry, and inside was a light broth and Poached Foie Gras. The broth was very delicious, crisp, sweet and steaming hot. However, the texture of the poached Foie Gras was a little odd for my liking. I would have preferred this dish to perhaps include some shredded chicken instead of the Foie Gras. Next we had the seared Foie Gras with Pineapple and Mango Salsa. Now, Foie Gras made many appearances in this meal, so if you aren’t a fan of this French delicacy, then maybe order something else. The Mango and Pineapple Salsa was very fresh and light; however, the Foie Gras seemed to have the same texture as the salsa. Although it was very silky, I would have preferred something with a bit of crunch to enjoy with this dish, perhaps some thinly sliced baguette lightly toasted. All in all, it was still extremely yummy. For our main course, we started with the Lobster and Ravioli – a stand out dish for me! The lobster was cooked to perfection, and the cream sauce with lemon squeezed on top was just so good. I would definitely return to Topaz for the Lobster alone! Coupled with the Lobster were handmade Spinach Ravioli. Seriously, could you think of a more dreamy combination! This dish was a 10/10 for me. Following the Lobster, we saw a return of the Foie Gras, in the form of Foie Gras Ravioli with Shaved Truffle and Cream Sauce. Now, this time, the Foie Gras was beautiful. There was not too much Foie Gras in this dish such that it overwhelmed the ravioli; it was very subtle and delicate. The cream sauce was simmered to perfection – thick and golden. The shaved truffle, coupled with the cream and the Foie Gras, was a match made in heaven. This dish was one for food connoisseurs – perfection! For dessert, we had the Grand Marnier Souffle and boy was it good! It was risen to perfection, with a beautiful sugary coating on the crust, and had a light and fluffy mouse-like texture within. It tasted similar to an orange and poppy seed cake, and was just so dreamy to eat! I definitely recommend trying this! We also tried the Chocolate and raspberry cake. The chocolate was very dark and dense and the raspberry was sour; the perfect combination! This cake was very rich, so I do recommend sharing. The Topaz chef’s definitely do an outstanding job with their French dessert! All in all, our experience dining at Topaz was wonderful. The service, the food and the atmosphere are perfect for a date night, or a nice family dinner. 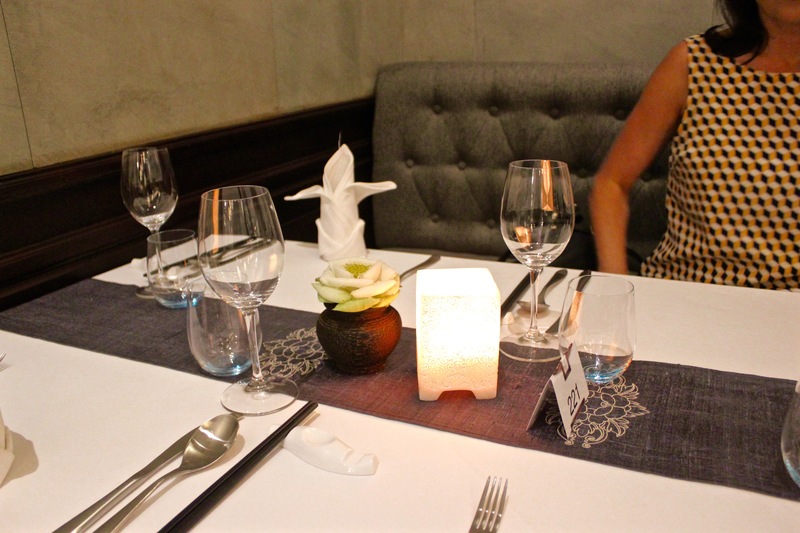 I definitely see why Topaz is rated the best restaurant in Cambodia, so whether you are a frequent visitor to Phnom Penh, or just here for a short holiday, Topaz will definitely be an experience that you won’t forget. * Recollectionsoffood were invited to dine at Topaz by the Thalias Group. However, all opinions are our own.